Due to technical issues, the organization of Rebellion Tour 6 has been forced to move the show in La Coruña (February 27) to a different location. The new place is 'Sala Chevalier', adress: Calle de Humboldt, 7, 15172 Oleiros, A Coruña. Tickets already bought for this concert are also valid for this new place. Rebellion Tour 6 is getting started next February 23, Monday, at Murcia, Spain. The tour is made of 7 stops, six in Spain and one in Portugal. 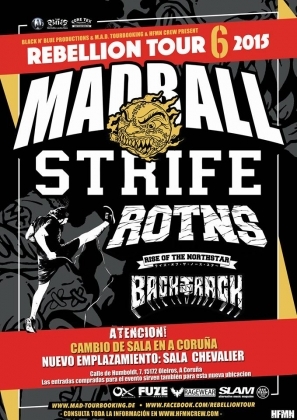 Madball, Strife, Rise of the North Star and Backtrack are the main bands playing on every concert, and there are going to be different guest bands on each show. Lisboa 26/02: Realty Slap + Push! Vitoria 28/02: Fourscore + Drop!